The Hart Foundation, one of the pillars of tag-team wrestling during the 1980s and early 1990s, will be inducted as part of the 2019 WWE Hall of Fame class on April 6. Bret “The Hitman” Hart and his brother-in-law, the late Jim “The Anvil” Neidhart, will be enshrined and recognized for their impact on WWE and tag-team wrestling in particular. Neidhart, who died suddenly last August, and Hart first teamed up in 1985 and were managed by fellow WWE Hall of Famer Jimmy Hart. During their time together, the Hart Foundation would become staples of WWE’s tag-team division, feuding with the likes of the British Bulldogs, The Fabulous Rougeaus and The Rockers. Although the duo would go on to have successful -- and now Hall of Fame -- careers, the Hart Foundation almost never came to fruition. 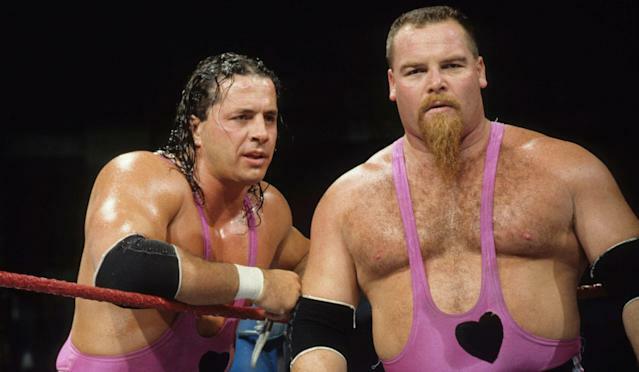 Initial plans were for Hart to develop a “Cowboy” Bret Hart persona and for Neidhart to remain a singles wrestler until a car ride through Canada changed the course of both stars’ careers. “I was going to do the rhinestone cowboy type of thing,” Hart recollected. “I was going to have a horse with the toy and they were going to sell it as a package and it would be a big seller. I was kind of excited about it. I was riding to Brantford, Ontario from Toronto with Jim and Adrian Adonis and I remember they started laughing about it and started chuckling about it and teasing me about it. It kind of got the best of me because I started thinking about what they were saying and thought maybe it wasn’t a good idea. A few weeks later, Hart had planned to quit and return home to Canada when Scott broke the news that he’d be teaming with Neidhart. Hart credits the burly Neidhart, who returned to the public eye after his wrestling career ended as WWE’s “Total Divas” reality show followed his daughter Natalya, for keeping him motivated and happy due to his positive, fun disposition. That side of Neidhart was also evident when he interacted with fans, a part of the job Hart says his brother-in-law truly loved. Hart and Neidhart’s impact on the wrestling industry stretched beyond their time with WWE. The two laid the foundation -- pun intended -- for future generations of Hart family wrestlers and even reunited in the late 1990s alongside Bret’s brother Owen Hart, the British Bulldog and Brian Pillman as a reincarnation of the Hart Foundation.